A recent report by research group Flurry using Alexa statistics has highlighted a milestone. 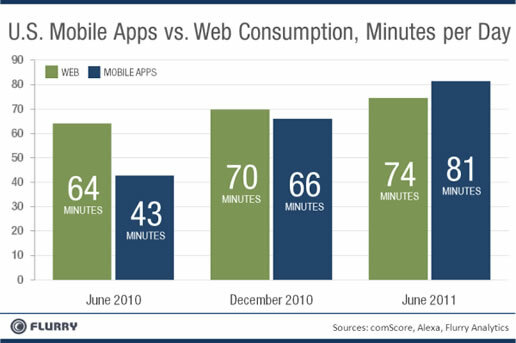 For the first time ever US mobile users spend more time using Apps than accessing the Internet from traditional means such as browsers. Convenience and user experience are reasons that apps are blazing ahead of traditional Internet use…but why? Similar to the way e-books have now surpassed traditional printed book sales. The key differentiators and drivers have been a new method of delivery and experience; in this case the trusted e-reader allows convenience and a more functional method of use when reading books on the go. Quite simply it is easier and again functional to click a button (rather than type in a URL) and the benefits in the case of social networks and news ad games is a quicker load time, an optimised experience and quicker access to the desired application. This shift relates to usability and is a natural progression when users are given easier options of access. 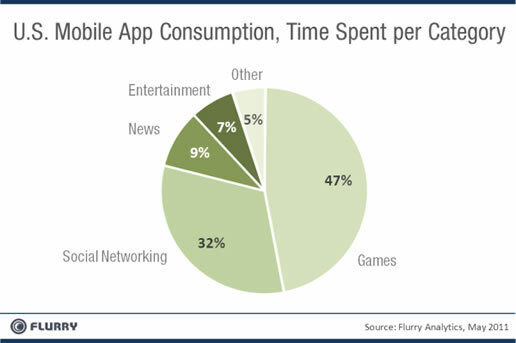 Looking at the chart we can clearly see that Games take sup close to 50% of all consumers time, with one third using Social Networks, when combined the total reaches approximately 80% of total app time, with users of these categories using them more frequently and for longer. This result is predictable when both categories currently offer the most engaging experience on mobile phones. With Facebook being used by such large quantities of people are such long periods of time, we wonder just what will happen with the HTML5 based “Project Spartan” which aims to allow Facebook users access to apps from within the browser, this sounds like a very clear tactics to dominate use even further. This space is likely to see three major players dominate, Google, Apple and we predict Facebook in time. What are your thoughts on apps? Do you prefer them over the Internet for browsing news and playing games….or is a traditional web page a preference for news or indeed your gaming desires?